The early American automotive industry was largely shaped by two men: Henry Ford and William C. Durant. Neither invented the automobile, but between them, they built the foundations of an industry that has endured for more than a hundred years. Henry Ford’s story is well known. His Ford Motor Company was incorporated in 1903, joining the hundreds of companies seeking to capitalize on the automobile opportunity. On October 1, 1908, the first Ford Model T was completed at the company’s Piquette Avenue plant in Detroit. It was a good car for its time, but the real innovation came next: By 1913, the car transitioned to mass production on a moving assembly line. By 1927, more than fifteen million Model T automobiles had been produced—the longest production run of any car model in history until the Volkswagen Beetle in 1972. Ford’s resume prior to founding his company is conspicuously lacking in experience with the horse-drawn carriage, which was the mainstream transportation industry of the time. He grew up on his family’s farm in Michigan, but he hated farm work and left home. He was always mechanically inclined. At the age of fifteen he dismantled and reassembled the clocks and watches of friends and neighbors, gaining the reputation of a watch repairman. He worked in a series of mechanical jobs, and at twenty-eight he was hired as an engineer by the Edison Illuminating Company, where he tinkered with a self-propelled vehicle that he called the Ford Quadricycle. Five years later, he was introduced to Thomas Edison, who approved of his automobile experimentation, which eventually led Ford to strike out on his own. Then there’s William C. Durant. Together with J. Dallas Dort, he founded the Durant-Dort Carriage Company in 1886. By 1900, it was the largest manufacturer in the industry, producing as many as 56,000 horse-drawn carriages per year. But that didn’t last long; seventeen years later they manufactured their last carriage. Automobiles were filling the streets, and the horse-drawn carriage industry was dying. That wasn’t the end of Durant’s story. Possessing a keen eye for opportunity, he came to own several Ford dealerships between 1903 and 1908. Seeing the writing on the wall, and wealthy from his carriage company success, he capitalized General Motors as a holding company on September 16, 1908. The next day GM acquired the Buick Motor Company, and it rapidly acquired more than twenty companies, including Oldsmobile, Cadillac, and Oakland, which later was named Pontiac. Durant was forced out of the company in 1911, so he partnered with Louis Chevrolet to start the Chevrolet Motor Company in 1915 and returned to GM the following year. The contrast between these two founders of the automotive industry reflects an important question: Where does innovation usually come from? Is it from inside an industry, like Durant, or from elsewhere, like Ford? In other words, who was the exception, and who was the rule? The advantages of incumbency generalize beyond the world of politics in two ways: reach and resources. Incumbents, like Durant in the transportation industry in the early 1900s, have established reputation, relationships, and infrastructure that allow them to reach more customers, and their past success affords them substantial financial and other resources to lean on. While Ford had to build his company more or less from scratch, Durant had the resources to buy Buick, Oldsmobile, and Cadillac and consolidate them into General Motors. These are all reasons why challengers might hesitate before getting in the ring with an eight hundred-pound incumbent. Yet, in spite of those advantages, history is laden with examples of the incumbent being defeated by the innovator. Amazon came from outside of book publishing, iTunes came from outside of the music industry, and Uber challenged established taxi companies—and all met with incredible resistance. Airbnb wasn’t created by the hotel industry, nor were TurboTax or LegalZoom created by big accounting or law firms. The computer mouse and graphical user interface were developed by Xerox, but their commercial success came with Apple and Microsoft. Similarly, digital photography technology was pioneered inside Kodak, but the company didn’t do anything with it. And even though Blockbuster had the inventory and storage in place, it was Netflix that came out of nowhere with mail-order DVD rentals. The list goes on, and on, and on, coming full circle to the automotive industry: While it started with an exciting bang, the last successful start-up car manufacturer was a little company in Detroit called Chrysler, founded in 1925. Almost exactly a century after the Ford Motor Company was founded, disruption came to an industry in desperate need in the form of a start-up in Palo Alto called Tesla. At its head was Elon Musk, a disruptive innovator and industry outsider in the tradition of Henry Ford. The conclusion is clear: Durant was the exception, and Ford was the rule, despite the substantial advantages of incumbents. Which raises the question: In spite of all their advantages, why do incumbents often lose? A big factor is that right up to the end, it looks as though they’re winning. Imagine you’re the despotic leader of a small, developing nation. From your subjects’ perspective, the regime may be suboptimal, but from where you’re sitting, things look pretty good. You have money, power, and almost anything else that you might wish for, except, of course, for the respect of your people. Although they may not like it, you have the advantages of an incumbent, which in your case includes tax collectors and soldiers. History has shown that periodic uprisings and protests can be handled with the iron fist of jailings and executions. So while the international community wags its finger, you shrug and continue business as usual. In this situation, you’re what Nassim Nicholas Taleb describes in The Black Swan as a “turkey.” For a thousand days, the turkey is fed and fattened by the farmer. Life seems good for the turkey, who doesn’t realize that every day brings it closer to slaughter. As Taleb writes, “Consider that [the turkey’s] feeling of safety reached its maximum when the risk was highest!”99 The same is true for the despot, who successfully quells any opposition right up to the moment when his head winds up on a pike! With many challenges over time, the incumbent almost always falls. Incumbents are like those despots and turkeys, seeing mounting validation that they’re doing well until the rug gets pulled out from under them. In any particular encounter, like an individual political race, the strong advantage goes to the incumbent. But with many challenges over time, the incumbent almost always falls. Why are incumbents so blind and resistant to change that in the grand scheme of things is almost inevitable? There’s also the challenge of opportunity blindness. A sense of “this is how we’ve always done things” quickly morphs into “and if there was a better way, we’d be doing it already.” This creates a skepticism about new opportunities that seems backed by a track record of solid data, like the experiences of Taleb’s turkey. Getting buy-in to change is difficult, and even if you can get it, it’s hard to focus on multiple things at the same time, hence Clayton Christensen’s recommendation in The Innovator’s Dilemma that innovation in large organizations is best led in a secret, independent “skunkworks” division, which introduces its own set of challenges. All these factors repeatedly have prevented innovation from coming to organizations that have every advantage—think Microsoft and the Internet, or Nokia and the iPhone—and we have every reason to believe that the same will be true in the realm of education. There’s much to be done in all these areas to get to where we need to be. However, we can expect that in the not-too-distant future, a lifelong educational path will begin with one or two years of foundational and “last mile” education, either taken separately or bundled together, with four more years spread over the rest of our lives and careers. Who will provide these critical building blocks of education? Cognitive inertia. The biggest strike against higher education is its legacy of success, and the blindness that creates the need for change. Mid-career administrators and educators in the institutional system today grew up in the 1980s and 1990s, when the prospects and value of higher education were very different from what they are now. The deep feeling of something being the way it is can be hard to shake, and even mounting evidence can be rationalized away. Sure, there are 2.4 million fewer students enrolled in the American system than there were five years ago,101 but there are still twenty million students in the system, which translates to about $600 billion per year. That’s a pretty big number! And the precipitous decline in faculties like law may be an anomaly as a bellwether of things to come. Lack of employability focus. The flip side to higher education’s focus on research is the lack of focus on employability. Much as top-tier colleges like to tout the self-reported employment rates and salaries of their graduates, the reality is that caring about employability is primarily relegated to the university’s marketing department and career services program, neither of which is anywhere close to the core of the institution’s promise or experience. Access to expertise. Even if colleges can overcome the cognitive inertia and want to change, most find themselves lacking the expertise to do so. The transition from just-in-case to just-in-time means that the only people with the expertise that students really need are the ones on the cutting edge of their industries. Generally speaking, those people are gainfully employed at places other than universities. If they moved to full-time teaching positions, it would take only a few years for their expertise to start going out of date. Tenure. Let’s say that institutions can overcome cognitive inertia, can find qualified experts who want to teach, and somehow can stay on the cutting edge of their field. Institutions are still constrained by the laws of tenure. The promise of a permanent position originally was designed to protect academic freedom, under the idea that it is beneficial for society if scholars are free to hold and examine a variety of views regardless of how they align with the orthodoxy of the day. That may be, but it also means that tenured professors can be terminated only for cause or under extraordinary circumstances. That translates to fewer job openings, and the tenured professors have great freedom to teach whatever aligns with their personal interests, as opposed to what students want and need to learn. Accreditation. Accreditation is the original formalization of signal. As institutions of higher learning popped up across the country and around the world, the need arose for a way of validating which were the real deal. This led to the accreditation industry, which includes multiple examiners with different levels of prestige and accrediting bodies to supervise them.103 Fundamentally, the way it works is that after a course is designed, the outline is shown to the accrediting bodies, who give it their stamp of approval. From that point on, the course content can be changed only so much without need to submit it for reaccreditation, which adds another layer of bureaucracy to an overburdened process. Only twenty-one cents of every tuition dollar is actually spent on instruction! This last strike against higher education is particularly telling because while everything else could be overcome, there’s a final nail in higher education’s coffin that most incumbents don’t face: money. Understanding this last part will take a detour, but it’s an important detour, because the economics of higher education will be the ultimate deciding factor. In 1983, the ownership of 90 percent of American media was split across fifty companies. By 2012, that number was down to six media giants that control 90 percent of what Americans read, watch, and listen to: Comcast, which owns NBC, Universal Pictures, and Focus Features; NewsCorp, with Fox, the New York Post, and the Wall Street Journal; Disney, with ABC, ESPN, and Pixar; Viacom, with MTV, Nickelodeon, and Paramount Pictures; Time Warner, with CNN, HBO, and TIME; and CBS, with its namesake channel CBS, Showtime, and the Smithsonian channel. This pattern of consolidation can be seen in industry after industry. Some big companies regroup to make a few even bigger ones, like the “big nine” accounting firms in 1986 consolidating into the “big four” by the early 2000s.106 An emerging market leader may leave everyone else falling by the wayside, like Google in search engines. Bing is a distant second, and most people don’t remember competitors like AltaVista, Lycos, or Mamma. At the top of some industries you’ll find a handful of giants—think aircraft manufacturers, telecom, or big consulting. In some markets there may be a single “winner takes most” structure in which one player owns the lion’s share, and the rest is spread among a handful of also-rans—think Netflix vs. Hulu and Amazon in streaming video, Uber vs. Lyft in ride sharing, or Facebook and LinkedIn vs. everything else in social networking. Consolidation generally happens in situations where one plus one adds up to more than two, for example, in the case of a couple coming together to start a family. There are many things that I can do alone, and the same is true of my wife, but to have children, we need each other. In our case, one plus one added up to four. The same principle operates on the scale of industries. If twenty companies can each invest a million dollars toward solving a problem, and the twenty-first company can invest twenty million dollars to solve the same problem, the last company has a clear advantage. The math in favor of consolidation is even stronger because there are also efficiencies to gain and replicated efforts to reduce. The resulting resources can be reinvested in the solution or passed on to the customer as savings. This will be true as long as the total of consumers and consumer dollars is large enough to justify the size of the agglomeration. In other words, when enough people want and need the same thing for such a large entity to make sense of providing it. Finally, there’s the flywheel effect of the rich getting richer. Compare the typical American (median net worth of $44,900107) with Warren Buffett (net worth upwards of $80 billion). Let’s assume both can invest the entirety of their net worth, and let’s take Buffett’s extraordinary investing skill out of the equation by promising both him and the average American the same percentage return of eight percent per year. In one year the average American’s net worth will grow by more than $3,592. That’s not too shabby until you consider that in the same time and with the same proportional allocation of resources, Mr. Buffett’s net worth will grow by more than $6 billion! Return is a function of investment, and the more you can put in, the more you stand to take out. This is why so many industries start with a “land grab” of companies racing to “get big fast”—a mantra that was taken to extremes in the days of the dot com bubble—because once you start getting a lead on the competition, that lead tends to compound itself. Imagine, for example, that you come onto the scene with search technology every bit as good as Google’s. Even with you and Google at the same starting line, you’re moving only as fast as you can innovate on your own, while Google is propelled by the combined efforts of thousands of engineers. 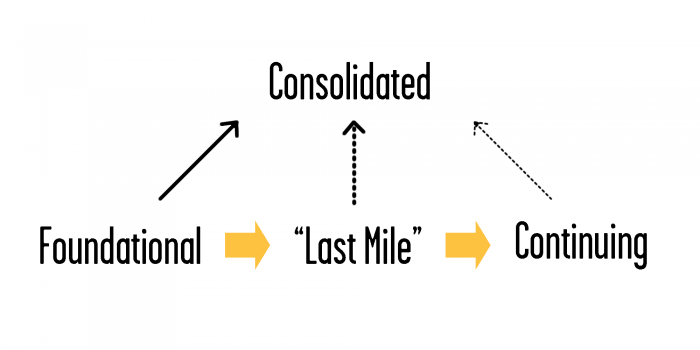 So industries consolidate when economies of scale can make one plus one add up to more than two, and companies can gain advantages by pooling resources and turning the flywheel on an existing lead to get even further ahead. Much of this logic applies to the world of education. Almost every one of the thousands of universities and colleges in the United States and around the world offers a Psychology 101 course, and the same is true in almost every area of study. Introductory courses often are delivered in auditoriums that hold hundreds of students, and most of the interaction and feedback is provided by teaching assistants. Does it really make sense for thousands of professors with varying levels of teaching ability delivering the same course when it can be done once by the best teacher in the world, as is the vision of MOOCs like Coursera? This math won’t work in every situation, but it fits well with the sort of education and training that lots of people need. This is true of foundational education that everyone requires, “last mile” education into popular career paths, and the most popular continuing education courses. While the catalog of possible courses is enormous, currently a third of all course credits earned in American bachelor’s degrees are in only thirty courses,108 which have a mainstream enough appeal to fit with consolidation. In all those cases, a huge number of people need the same thing, and there is much to be gained by offering a single best-in-class solution rather than a large variety of mediocre ones. Remember that consolidation happens when one plus one equals more than two, which is in situations where synergies and efficiencies allow for resources to be better deployed by one big organization than by many small ones. It also occurs when there is a large enough market of people who want the same thing. This sort of education will be consolidated into a relatively small number of providers. There are three places these providers could emerge: top universities, staffing firms, and upstarts. Top universities. If I had to bet on one place that today’s universities will grow into, it is offering mainstream foundational education and perhaps popular continuing education classes. After all, that’s what they strive to do today, albeit not very successfully. There won’t be many winners because that’s how consolidation works. Also, it will be a scary proposition for colleges to undertake. Since part of the value of their signal comes from its scarcity, they risk the commoditization and cannibalization of offering it on a mainstream basis. In other words, while courses from top schools like Harvard, MIT, Stanford, and others are available online at low or no cost, the value of degrees from those institutions would plummet if anyone could get them that easily. However, their name recognition and reputation give them a significant advantage, and they have the financial wherewithal to take risks: the five richest schools alone each have endowments ranging from $22 billion to $38 billion.109 Each is larger than the gross domestic product of almost half the countries of the world, and in combination more than the GDP of Morocco (population 35 million) or the Ukraine (population 45 million).110 That’s enough money to pay for a lot of risk taking and experimentation, if leadership has the stomach for it. Staffing firms. The second likely candidate from which “last mile” education in particular is likely to come is staffing firms. Staffing was a $428 billion industry globally in 2016,111 with market leaders like Adecco, Randstad, and ManpowerGroup earning in the range of $20 billion each year. Their revenues are directly correlated with their ability to and and place skilled people, and the skilled worker shortage in the United States alone could be worth many tens of billions of dollars to them, so their motivation will be strong. Unlike the incumbents of higher education, they have nothing to lose by entering this space with mainstream training. But on the other hand, this does mean a significant step beyond their current scope of focus, which requires vision, can feel risky, and depends on the development of expertise that they don’t currently have. We can expect a large part of the educational landscape to be concentrated into a small number of top providers, and I’ve shared my best guesses as to where those providers are likely to emerge. But that’s only half the story because just as parts of the education landscape consolidate, others break apart. 1. Where does innovation usually come from: inside an industry, or elsewhere? 2. What are the two big advantages of incumbency? 3. Why are incumbents less likely to embrace change and innovation? 4. What are the major anchors and blinders hampering today’s colleges/universities from innovating? 5. Universities do double duty as both teaching and research institutions. How does this get in the way of effective teaching? 6. How do the laws of tenure constrain education? 7. What conditions set the stage for consolidation, and how do those conditions apply to higher education? 8. Who are the three most plausible categories of providers of consolidated foundational or “last mile” education? 9. What do staffing firms have at stake in improving higher education? 10. What are some of the signs that startups are disrupting and innovating in the space of education?